With Gamespy’s end date looming, the gamut of early noughties multiplayer shooting is threatened with sudden termination. While EA struggle to find a way to save Battlefield 2, however, a Bungie-backed squad of Halo fiddlers has assembled to ensure the studio’s opus sees the next month. 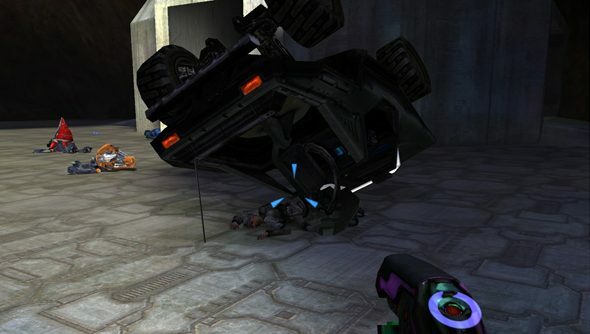 Bungie software engineer Roger Wolfson has led a small group of Halo modders in “quietly” prepping for the shutdown of Gamespy’s master server, which powers Halo’s multiplayer lobby on PC. Their work has led to a new patch for Halo: Combat Evolved. Bungie will release version 1.0.10 as an official update. Once downloaded, it’ll enable players to continue using the game’s lobby uninterrupted by Gamespy’s May 31 deadline. Wolfson was test lead for Halo: Combat Evolved on PC back in 2001, and has worked on server-side applications for the studio since. He’s joined on the project by Halo modders Btcc22 (of HAC2), Kornman00 (of OpenSauce), and Technut (of PÕQ Clan). Details on how to update will follow in another post nearer the time, said Technut. Will you be helping Halo evolve just one last time?